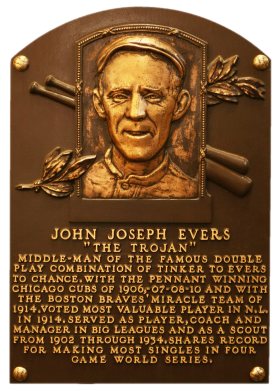 Perhaps the best of the "Tinker-to-Evers-to-Chance" double play combination, second baseman Johnny Evers relied on a steady glove and just enough hitting to help lead his club to five pennants in 16 seasons. 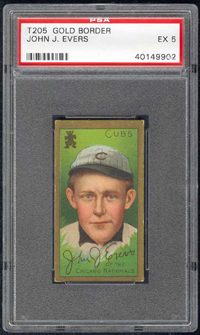 Although he played most of his career with the Cubs, in 1914 he was the NL MVP while with the "Miracle" Boston Braves. "The Trojan" retired with 919 runs scored and 324 stolen bases. 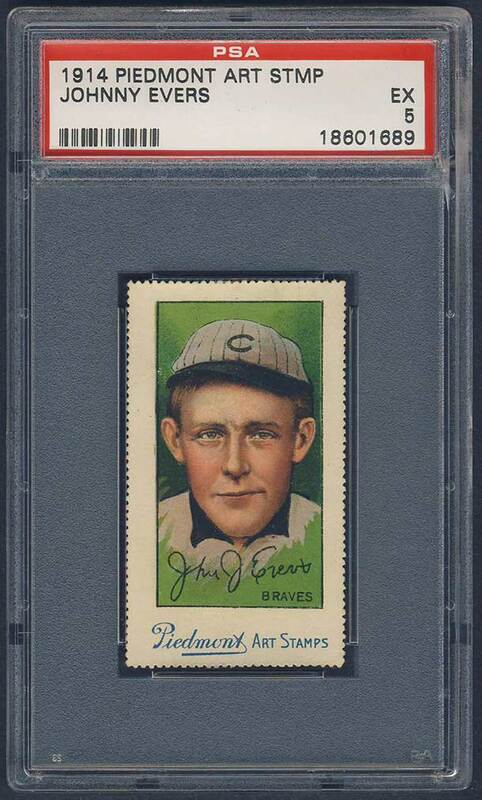 Comments: T205 has always been the portrait for Evers - a PSA 4 purchased in January, 2003 via eBay. In March, 2004 I picked up another PSA 4 example with a different back directly off the Full Count website (John Spencer). The card was sold and I ended up buying a raw example, then a PSA 2, followed by another GAI 3.5. In January, 2005 I upgraded to a PSA 5 after winning an eBay auction. I swapped it out for a different back, this Honest Cut, with a direct purchase off the Larry's Vintage Baseball Cards website (Laurance Mayer). EX condition with NO creases and wrinkles. Beautiful. Check out the centering. 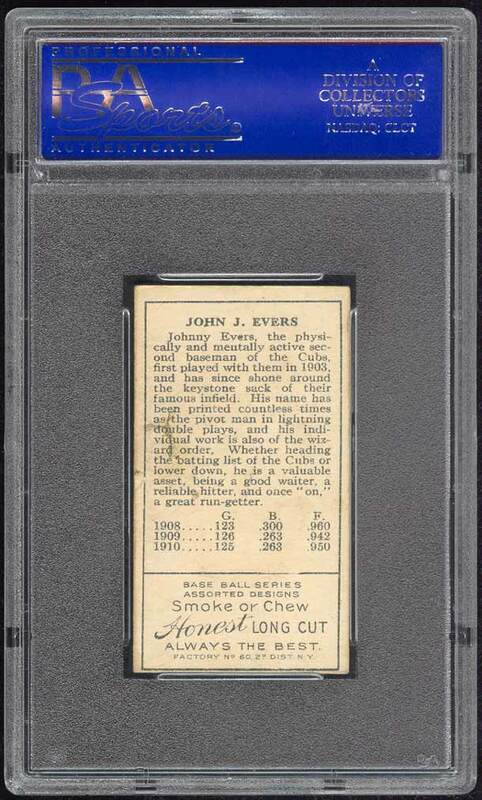 And, to top it all off - RARE Honest Long Cut Reverse! 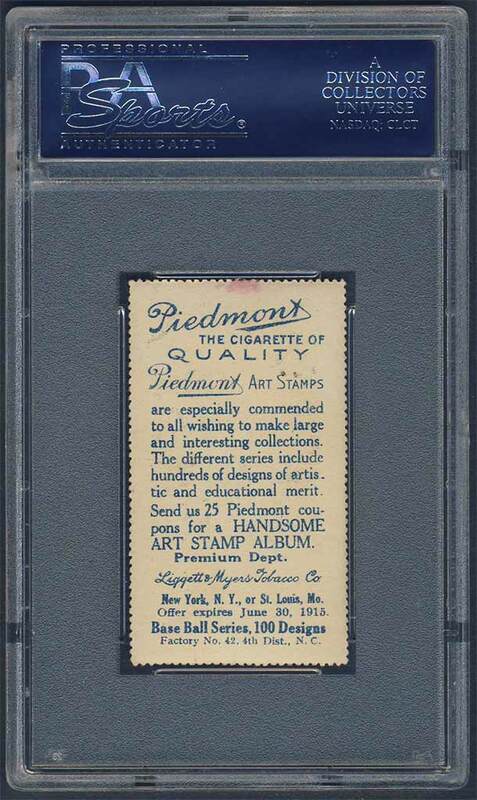 Comments: A few years ago I had a chance to buy a 1914 Piedmont Art Stamps Evers and passed on the opportunity. It was the highest graded example in the hobby sitting in a PSA 5 holder. I’ve regretted the decision ever since. Luckily, the same card came up in the Summer 2016 Goodwin auction and I was going to pounce. The ending price was a little higher than the original offer but it’s mine now. It’s a great piece in amazing condition and I’m thrilled to own it. 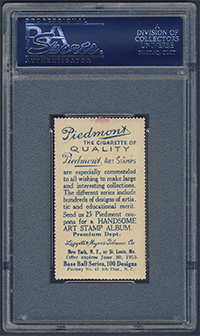 Description: The series of "Piedmont Art Stamps" looks like a fragile version of the more popular T205 Gold Border tobacco cards of 1911, employing the same basic design on the front. The Piedmont stamps measure 1-1/2" X 2-5/8". Though the backs advertise "100 designs", more than 110 different players are known. 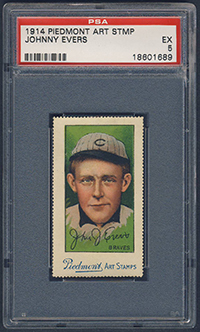 And, because some of the players are pictured in two separate poses, there are actually 118 different stamps known, with new discoveries still being made. All but three of the subjects in the Piedmont set were taken from the T205 set; the exceptions being Joe Wood, Walt Blair and Bill Killifer. Because of their fragile composition, and since they are stamps that were frequently stuck to album pages, examples of Piedmont Art Stamps in Near Mint or better condition are very scarce. The back of the stamps offered a "handsome" album in exchange for 25 Piedmont coupons. The set has an American Card Catalog designation of T330-2.